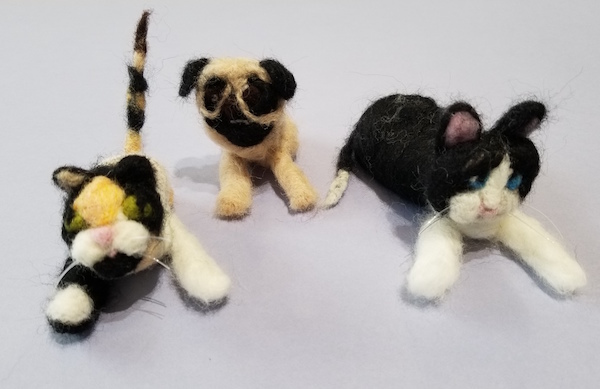 Join artist Norma Tolliver for a fun afternoon of sculpted needle felting. Using loose wool fibers, students will be taught how to form a three dimensional cat or dog shelf sitter. Step by step instruction and all materials are included in this two and a half hour workshop. Everyone goes home with their own special, lovable dog or cat! Includes all materials to make one special dog or cat. Open to students ages 15 to adult. Class size limited to 15 students. Send us a picture if you wish to sculpt your pet! All pictures must be sent to mainavegalleria@gmail.com a week prior to the start of class.